Turn It UP! Support the Movie on Indiegogo! Turn It UP! is a feature-length documentary, celebrating the Electric Guitar. TURN IT UP! 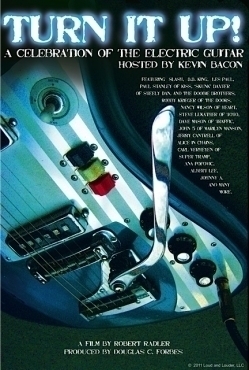 explores the electric guitar, and the unique place it holds in global pop culture, as well as the hearts of those who are dedicated players. Hosted by Kevin Bacon, the cast includes B.B. King, Slash, Les Paul, Robby Krieger, Paul Stanley, Nancy Wilson, Steve Lukather, Skunk Baxter, Jerry Cantrell, Albert Lee, Carl Verheyen, Rick Vito & many other great guitar players. Filmmakers Robert Radler and Doug Forbes have been working on this project over the last five years. The film is almost ready! Licensing of the clips and music used in the film. (These licenses have been negotiated, and are simply awaiting payment for execution). Final color-correction and preparation of the master. They are offering an amazing array of perks & rewards at every level of contribution. Want a guitar session with Robby Krieger of The Doors? How about Skunk Baxter’s personal guitar? Or an early release copy of the film? Need some pickups, strings or picks, or just want to support a cool project? It’s important that they achieve 50 backers on Day 1 of their launch to increase the chances of making the front page of Indiegogo – be one of those 50!! Please reach out to your friends via Facebook, Twitter and email so that they can get the momentum going! If they don’t meet their goal, Turn It UP! may never be seen!